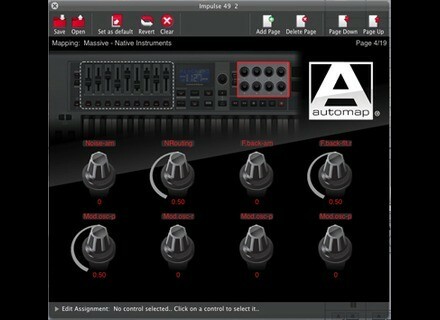 Automap 4, Other Music Software from Novation. 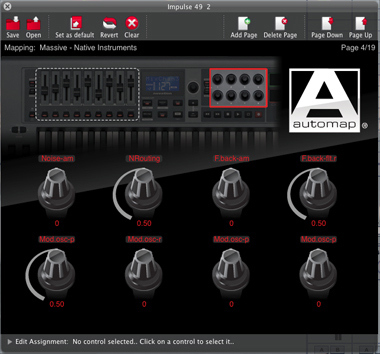 Novation has updated Automap to version 4.4. Announced improved support for Reason on Impulse keyboards. A fix for black-note glissandos on Impulse keyboards. Built in uninstaller so you can quickly remove Automap for troubleshooting purposes. Added Mac Automap Uninstaller in the Applications folder. Added support for Reason's Main Mixer (remember to lock Mixer to the master fader). Automap now installs extra virtual MIDI port 'Automap Propellerhead Mixer' for Reason's Main Mixer support. Updated Reason .lua file so that controllers can use either CC11 or CC65 for expression. Updated Dr Octo Rex parameters list. Impulse keyboard will now auto-detect in Reason. Updated Impulse firmware to version 667: fixed MIDI note conflict when using zones; fixed black keys velocity response. Added Impulse 25 Fader as its own mapping. Fixed page button not paging in Reason mixer map. Fixed track up and down not working for non-Impulse controller on Reason mixer map. Removed out of date Reason's Impulse remote and lua files. Added 'shift forward' and 'shift rewind' to bank between 8 channels of mixer in Reason for Impulse 25. Added Logic 9 64 bit AU plug-in wrapper friendly option. User with Remote SL Original will not be prompted to update OS if it is out of date. Widened plug-ins path column for Windows. Bigger font on first page of Setup Wizard. Automap will not allow install on OS X 10.5 system. Fixed AU plug-ins crashing in certain hosts. Added Reason Essential to setup wizard. Updated Live setup guide to include sync info. Updated DAW setup guide so it asks to connect hardware first before launching software. Added Launchpad setup guide for Ableton Live. Added default mapping for Cytomic The Glue. Improved Reason 14:2 default mapping SL MkII. Improved Logic mixer mapping for Remote SL (original). Improved default mapping for LoopMash 2. Fixed potential crash when quitting from Dock on Mac. Fixed Automap hanging when quitting on Windows. Fixed Device Calibration window not opening in full size. Fixed blank screen and misalignment appearing in Device Calibration window. Fixed not being able to add a VST path folder if a subfolder is already in use on Windows. Fixed not being able to enter decimal value in the To/From box in parameter ranges. Fixed Fabfilter VST3 not being recognised in some Windows systems. Fixed host crashing when launching VST3 version of Waves H-delay. Fixed error when running Automap under non-admin in OS X. Fixed duplicated VST plug-ins crashing host when loaded. Re-wrapping plug-ins is required for this fix. Fixed Garageband crashing when loading. Fixed VST plug-ins not focusing under 64 bit Cubase. Fixed certain combinations of VST plug-ins causing Cubase to crash on quit or when the plugin UI was closed (Mac). Fixed incorrect version number when RTAS plug-ins are wrapped causing NI Service centre to prompt to upgrade the plugins. (If you have experienced this issue, please re-install the RTAS version of your plug-ins then re-wrap for this fix to work.). Fixed issue with some RTAS plug-ins not auto-focusing or crashing when changing focus. Some customers were experiencing issues with iLok authorisation failing after automap-enabling RTAS plugins, even after they were unwrapped. (If you are experiencing this issue, please re-install the RTAS version of your plug-ins then re-wrap for this fix to work.). Fixed learn mode auto turn off on Impulse mixer when trying to learn plug-ins parameter for Pro Tools. Removed options from range tab when QWERTY is being assigned. Fixed Learn mode not auto turning off after learning. Added additional notes in Mac Installation welcome screen regarding renaming and moving Automap. Fixed Hardware "Focus device" setting. Fixed not able to Learn with Impulse 25 on Windows. Ohm Studio Release Date Ohm Force has announced release date, pricing and pre-orders for Ohm Studio.